Railing in several styles including pre-shaped sections for upswept bow. Vertical and inclined ladders, yardarm footropes, watertight doors, cable reels, life preservers, pulley block rigging, bridge window frames, floatplane propellers, D.F. antennas, French warship motto plaques. Radars: CXAM-1, SK, SK-2, SC, SC-2, 3, 4, &5, SA, SA213, SR, SRa, SRb, SR-5, SV. SJ, SPS-37, SPS-10, SPS-40, Mk. 8, Mk. 12, Mk. 22, French DRSV, and assorted radar grids for custom work. 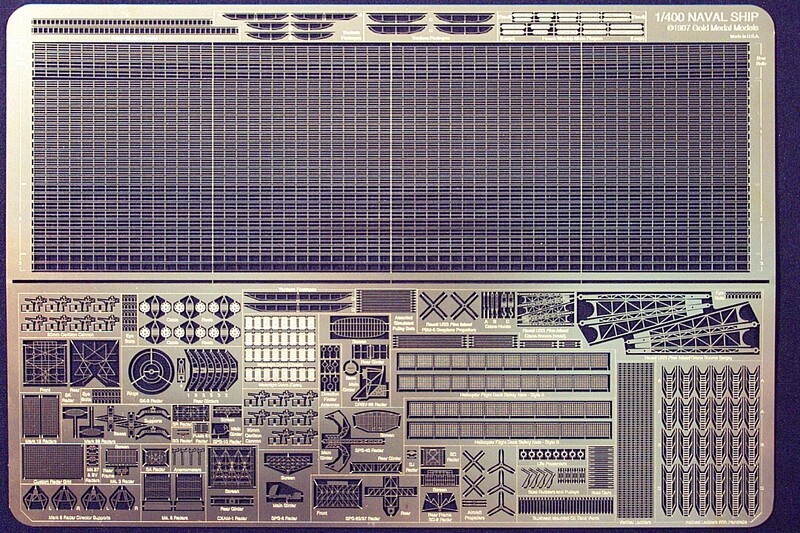 Fits all Heller 1/400 kits. Also fits classic Revell kits of Hawaiian Pilot, Doctor Lykes, Burleigh, Pine Island, Norton Sound, J. L. Hanna, Mission Capistrano, Randall, and Montrose. Specific parts for Pine Island include crane booms, PBM propellers, 20mm Oerlikon guns, SK-2 radar, etc.